Thanks to the latest developments in digital technology such as robotics, artificial intelligence and high-performance computers, the self-driving cars we once fantasised about in films and books are about to become reality. How can self-driving vehicles benefit Europeans? Human error is involved in about 95% of all road traffic accidents in the EU, and in 2017 alone, 25,300 people died on the Union’s roads. Driverless cars and lorries can drastically reduce these figures and improve road safety, while new digital technologies can also reduce traffic congestion and emissions of greenhouse gases and air pollutants. Mobility can also be improved, for example by opening up road transport to the elderly and those with reduced mobility or disabilities. In coming years, the self-driving vehicles’ market is expected to grow exponentially creating new jobs and developing profits of up to €620 billion by 2025 for the EU automotive industry. What are the challenges of autonomous driving in the EU? Road safety: since driverless vehicles must share the road with non-automated vehicles, pedestrians and bicycles, appropriate safety requirements and the harmonisation of traffic rules at EU level are essential. Liability issues: as self-driving vehicles transfer the driving tasks from humans to autonomous technologies, existing EU liability laws need to evolve and clarify who is accountable in case of accidents: the driver or the manufacturer? Data processing: EU data protection rules apply also to the automated sector but no specific measures have been taken yet to guarantee cybersecurity and protect self-driving vehicles against cyberattacks. Ethical questions: self-driving vehicles have to respect human dignity and freedom of choice. EU guidelines for artificial intelligence are being drafted but specific standards might be necessary. Infrastructure: significant investment in research and innovation is vital to develop technologies and deploy the necessary infrastructure. EU policies and legislation concerning automated and connected transport should cover all transport modes, including short-sea shipping, inland waterway vessels, drones transporting goods and light rail systems. Standardisation efforts at international level need to be further coordinated to ensure safety and the interoperability of vehicles across borders. Event data recorders should be compulsory in automated vehicles to improve accident investigations and tackle the issue of liability. 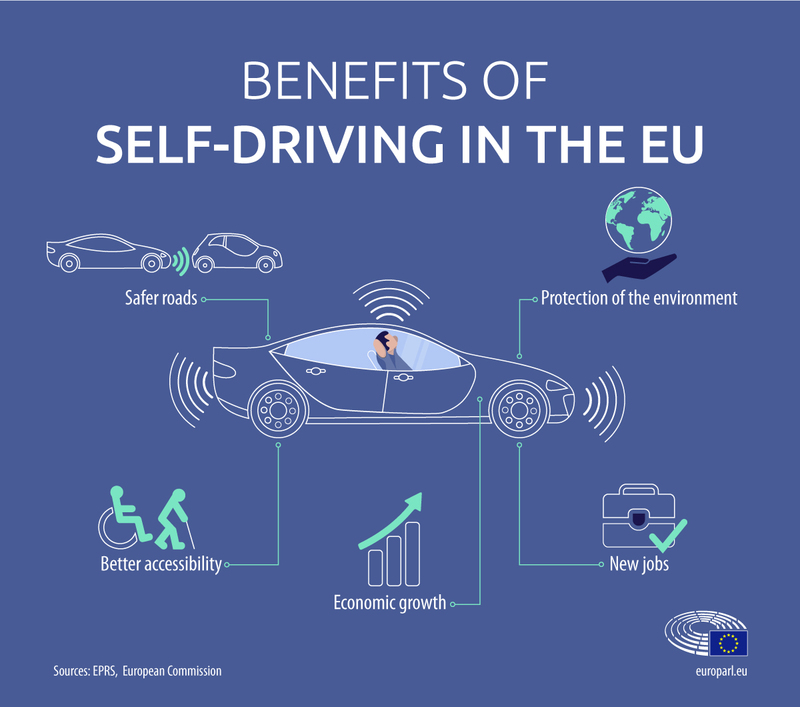 To increase the trust of Europeans in driverless vehicles, rules covering data protection and ethics in the automated transport sector should be developed without delay. Special attention should be given to the development of self-driving vehicles that are accessible for people with reduced mobility or disabilities. Automated cars are equipped with sensors, embedded cameras, in-car computers, high precision GPS, satellite receivers and short-range radars and perform all or part of the driving tasks. 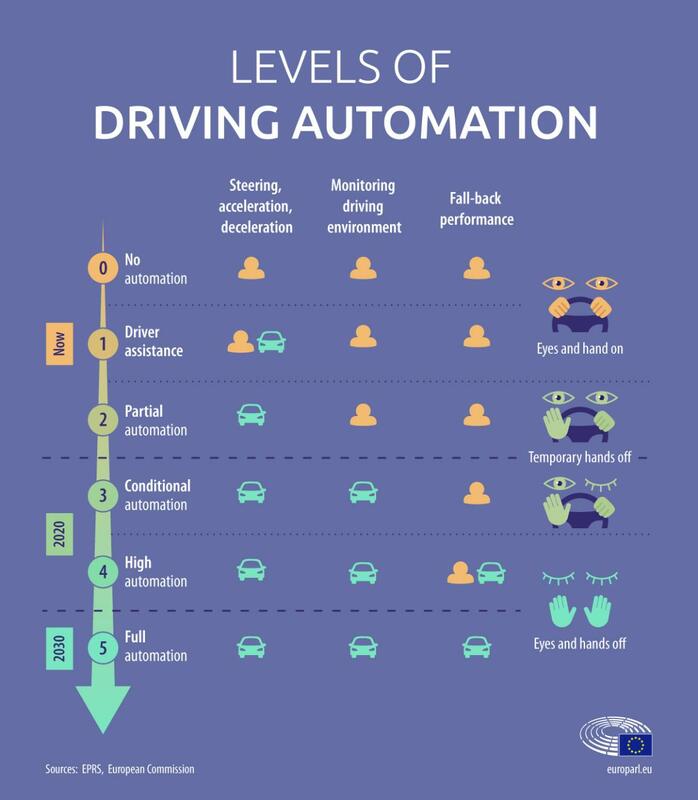 Vehicles assisting drivers (levels 1 and 2 of automation) are already on the European market. Self-driving vehicles (levels 3 and 4) are currently being tested and are expected on the market between 2020 and 2030, while fully automated vehicles (level 5) should arrive as of 2030. How fair do Europeans think life in the EU is? Who´s smarter in the classroom: men or women? EU elections: how many MEPs will each country get in 2019? Where does respect for others begin? Launch of the manual "Writing Peace"
Who is lobbying the EU? Have you heard about #YouthWiki?